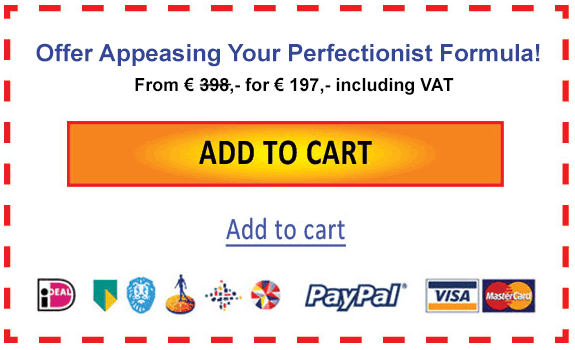 The Appeasing Your Perfectionist Formula Module contains everything an HSP needs to come to terms with their perfectionisme, to relinquish their need for control and to let things go. * You have very high (maybe too high?) expectations of yourself and others and you always want to do your best. * You are often disappointed (in people) because they don't meet your expectations. * You have problems lettng go and this causes you to worry and overthink. Your mind is always busy and there is never really time to relax. * Control is important to you and you don't like it when you loose control or when things happen outside of your control. * You often start things, but then you seem to be unable to finish them and this causes you to be really hard on yourself. * You want to be kinder to yourself and you want to learn that good is good enough. You will learn what perfectionism means to you and why you can be perfectionistic in some area's while you are not in others. You will learn how to lower your expectations, how to cut yourself (and others) some slack and in the process you will no longer be disappointed so often. You will also learn how to let go, to surrender, to stop worrying all the time and how to start trusting in yourself and have faith in your own abilities. MORE INNER PEACE- Because you no longer want to have iron control over your life and you can now let things go more easily. MORE HAPPINESS - Because you will have lowered your expectations, especially those of yourself and this makes it easier to be proud of yourself and your accomplishments. LESS STRESS - Because you no longer worry and think about everything or trying to control the things you have no control over. MORE ENERGY- Because you stopped wasting all your energy on things you can't control so you know have more energy for the things you love. MORE TRUST & FAITH - Because everything in life requires less effort now that you have stopped trying to control everything and in stead started to trust yourself and have faith in your abilities. The Handle Perfectionism Plan will give you insight into your perfectionism and how you can handle it in a different way. The Letting Go Protocol consists of easy to follow steps that will allow you to let go of everything. This will give you valuable insight into why it is so hard to change and how you can achieve that change anyway. A specific step by step plan that will have you stop worrying in no time! Everything you will need to trust in yourself completly and have unwaivering faith in your own abilities.